All transactions are safe and secure with a reliable history in online purchasing behind each of our associates. 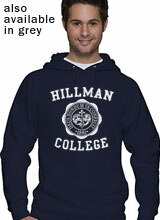 Buy the Hillman College Hoodie to own Cosby Show clothing and merchandise. Stay warm in this comfortable Cosby Hillman hoodie that displays the university's seal on the front. The logo was meticulously recreated to resemble the college seal seen on the spinoff TV show A Different World. In addition to navy blue or black hoodies with a white design, the logo can also be purchased in maroon on white or ash grey. Stay cozy while supporting Cliff Huxtable's alama mater. For a complete ensemble that would make him proud, wear it over one of The Cosby Show t-shirts available in the gallery. In addition to the Hillman College Hoodie above, browse the Cosby Show Clothing Gallery for more apparel like men's and women's clothes, kids shirts or hoodies.